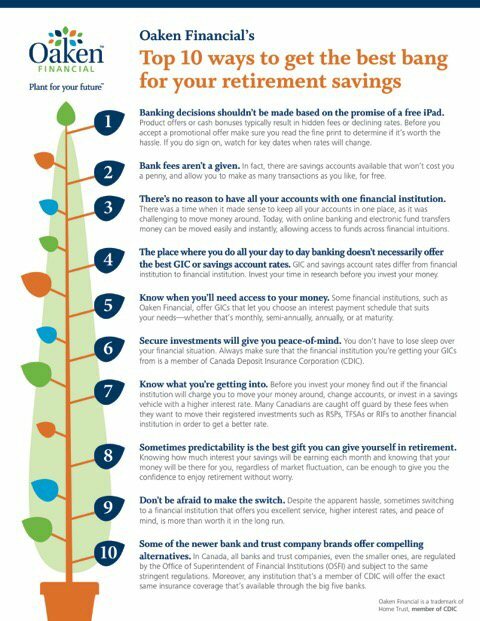 Oaken Financial's advice on retirement: do your research! TORONTO, ONTARIO--(Marketwired - Nov. 20, 2014) - According to The Oaken Financial Retirement Readiness Poll conducted by Ipsos Reid, 54% of Canadians age 55+ don't know if they're getting the best possible rates on their investments from their current banks. And while financial literacy typically steers smarter investment decisions, it can be challenging - no matter how financially literate a person is - to get a coherent story from a bank that is written or explained in an easy to understand manner. The vast majority of respondents also feel deceived by the tactics employed by the financial institutions they've been investing with over the years. As much as 93% of respondents said they don't like the tease 'em and trap 'em practices many banks resort to. Many financial institutions offer enticing promotions for new customers - from free iPads to high (but temporary) interest rates - but don't extend these same deals to existing clientele. Still, despite their frustration and lack of trust, 75% consider switching financial institutions to be too much of a hassle. In response to these concerns, Oaken Financial is taking a different approach when it comes to saving, opting for a what you see is what you get approach. "We've never gone the route of teaser rates or promotions with lots of fine print. Instead we believe in making sure all of our customers, big and small, new and old, get the same great service and investment opportunities with no surprises - no bait and switch," said Benjy Katchen, Vice President of Deposits for Oaken Financial. "Our message to Canadians, especially during Financial Literacy Month, is to do your research." Having enough money for retirement is a concern the majority of Canadians face. Whether that's because of the rarity of company pension plans or lack of savings due to a variety of reasons, 57% of those polled say they're worried they won't have enough money each month after they stop working. Interestingly this number declines only slightly (to 49%) for those in the highest household income bracket (>$100K). All of this uncertainty is causing more than one quarter of Canadians ages 55 and up to admit to losing sleep at night. "We encourage our customers in this age bracket to invest at least a portion of their nest egg in investments that provide predictability and stability such as Guaranteed Investment Certificates," said Katchen. Canadians can easily compare GIC rates across all financial institutions by looking at rate tables in most major newspapers or via websites like RateSupermarket.ca or Cannex. Doing the requisite research often results in reward. In this low interest rate environment, a one percent difference could actually result in doubling the interest rate. If this is the case, then switching financial institutions might actually be worth the hassle. Oaken Financial was launched by Home Trust Company in 2013 to offer Canadians a competitive alternative to manage their savings independently, featuring some of the highest GIC rates available with no monthly fees. Oaken Financial is a trademark of Home Trust, which is a member of the Canada Deposit Insurance Corporation (CDIC). Deposits with Oaken are eligible for deposit insurance up to limits established by CDIC. Oaken has locations in Toronto, Calgary, Halifax and Vancouver, and provides customer service via phone and email to customers across the country. The name Oaken was carefully selected to represent the values of strength, stability and security. Home Capital Group Inc. is a public company, traded on the Toronto Stock Exchange (HCG), operating through its principal subsidiary, Home Trust Company. Home Trust is a federally regulated trust company offering deposits, residential and non-residential mortgage lending, securitization of insured residential first mortgage products, consumer lending and credit card services. Licensed to conduct business across Canada, Home Trust has offices in Ontario, Alberta, British Columbia, Nova Scotia, Quebec and Manitoba.